Participants engage in dialogue at he NIH workshop. Research provides insight; insight inspires innovation; innovation translates into improved health outcomes for Alaska Native people, and communities around the state. Southcentral Foundation, the Alaska Native Health Board, and the National Institutes of Health National Human Genome Research Institute cohosted a workshop to examine historic approaches to research and explore new possibilities for collaboration in July. The workshop included both national and statewide attendees representing Tribal organizations, councils, and communities; research organizations; and SCF Research and senior leadership. SCF Research was established in 2006 to improve the health and wellness of the Native Community through in depth health services research. The research conducted by this department addresses a wide variety of medical and behavioral health topics, which are aligned with SCF’s wellness objectives; ensuring research is respectful and beneficial to customer-owners. When asked about why this conference was so important, SCF Senior Researcher Dr. Vanessa Hiratsuka shared, “As genomic research becomes increasingly important to advancements in medicine, populations that are not meaningfully included in genomic research risk not benefiting. Alaska Native people have historically been under-represented in biomedical research generally, and in genetic research specifically. Over the two days, the workshop created dynamic and engaging dialogue that explored the priorities related to genomic research in the state and how to translate the research into action that can further improve the approach to health care. 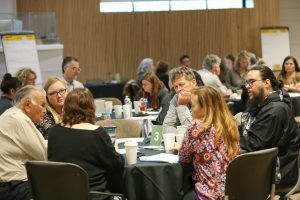 Attendees explored current barriers that exist due to historic approaches to research, shared best practices for the inclusion of the community and the voice of Alaska Native people, and learned about existing collaborations and work being accomplished. Workshop participants were also given an opportunity to provide input into the 2020 National Human Genome Research Institute Strategic Plan. While the workshop was exciting and new in its approach by including such a broad scope of stakeholders, the relationships between SCF and NIH is not new. SCF has received several grants from the NIH in the past 15 years. SCF President/CEO Katherine Gottlieb has served on the National Library of Medicine’s Board of Regents, and in 2017, Katherine spoke at the NIH campus which resulted in an invitation to return along with SCF’s Board of Directors and senior leadership to meet with NIH where possibilities for further partnerships, including co-hosting the workshop, were explored. Additionally, SCF Director of Research Dr. Denise Dillard and SCF Medical Services Division Senior Director of Quality Assurance, Dr. Donna Galbreath currently serve on the NIH Tribal Advisory Committee. SCF is grateful to all those who traveled to participate in this meaningful workshop and is excited for the collaborations that were further developed during the workshop. For more information contact, SCF Research at -(907) 729-8623.